Dr. Trisha Ghosh is a trusted Dentist and Orthodontist in Shibpur, Howrah. She has been a practicing Orthodontist for 5 years. She has completed BDS and MDS - Orthodontics. She is also certified in Lingual Orthodontics from AIIMS- New Delhi. You can consult Dr. Trisha Ghosh at Apollo Clinic Howrah in Shibpur, Howrah. You can book an instant appointment online with Dr. Trisha Ghosh on Lybrate.com. 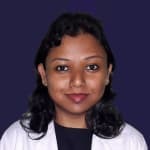 Lybrate.com has a number of highly qualified Dentists in India. You will find Dentists with more than 42 years of experience on Lybrate.com. Find the best Dentists online in Howrah. View the profile of medical specialists and their reviews from other patients to make an informed decision. Dr. Trisha Ghosh is very knowledgeable and well trained in her field. She listens to the issues and advises not only as a doctor but a friend. Has been very helpful throughout the process, whenever required, she has even assisted me on calls. I would definitely recommend her to friends and family. Dr. Trisha Ghosh provides answers that are helped me improve my health and caring. Thank you so much.